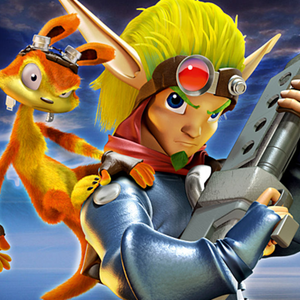 I personally don't consider Jak and Daxter: The Lost Frontier canon. I did like the Dark Daxter concept for it though. Jak and Daxter: The Precursor Legacy,Daxter, Jak II, Jak 3, and Jak X: Combat Racing are canon to me. I have all the games except for Daxter, PlayStation Move Heroes, and PlayStation All-Stars Battle Royale. This will be an audio drama series for Jak and Daxter. The time period hasn't been selected for the script, but me and a friend have discuss several concepts we could use for the script. Me and her are still going over everything. All the characters that are listed deal with one concept or another. Decided to use quotes from Jak II since I have none script wise. If you need an example of how Torn sounds then please take the time to view the link. 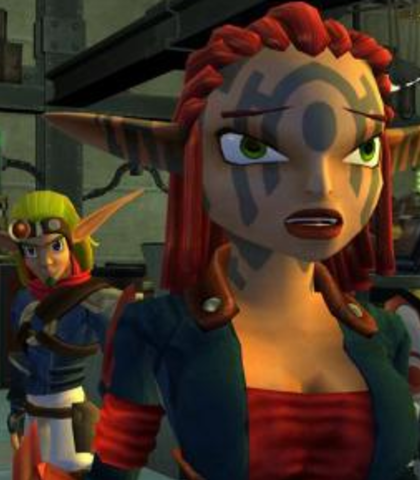 Torn is initially a cold, mistrusting character, very suspicious of new faces and unwilling to make new acquaintances unless it proves useful or beneficial to the Underground (Jak II). In Jak 3, he becomes much more laid back, despite the war, though also becomes more proactive in leadership, heading many fronts of the war. He also appeared to be much more comfortable with Jak and Daxter, and even retained a close friendship. He also appeared to be very compassionate towards Ashelin, selling out the entire Underground so as to not risk her father killing her. Torn: New faces make me nervous. Word is you're out to join the fight for the city. You know, picking the wrong side could be... unhealthy. Torn: The Baron turned off all water to the slums. He's willing to sacrifice innocent lives, just to destroy the Underground! I shouldn't be surprised. I've seen his evil before, while serving in the Krimzon Guard. That's why I quit. If you need an example of how Daxter sounds then please take the time to view the link. 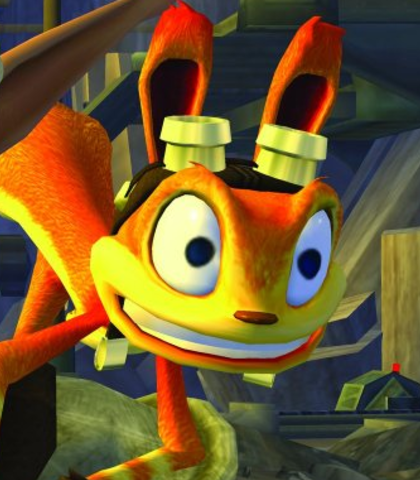 Daxter has provided comical relief throughout the series, and despite being a significant plot factor in The Precursor Legacy and Daxter, was not really present there for any purpose otherwise. In an interview with Naughty Dog's creative director, Dan Arey, it was stated that "Jak is the hero you want to be, Daxter is the hero you're afraid you are. Daxter is just a little bit concerned, a little bit afraid, and he would rather take the easy way out." Daxter also, despite being cowardly, attempts to paint himself in the hero's light, exaggerating stories to make him out to be the "real" hero, with Jak merely as a sidekick, though when faced with danger aptly backs away. Albeit, Daxter has shown some heroic and loyal traits, sending after Veger when he taunted Jak about his childhood and early separation from Damas, his father. Daxter also stayed behind with Jak when he was banished to the Wasteland, and also went on a two-year-long journey to free his friend from prison. Additionally, after being doused with dark eco for a second time, Dark Daxter appears to be braver and reckless, being a self-proclaimed "top-of-the-food-chain" predator. Daxter: Okay, I swear that's the last time I ever, EVER, touch any stupid Precursor crap! Daxter: What about the Metal Heads?! It ain't no petting zoo out there... peeps be getting deep sixed! If you need an example of how Ashelin sounds then please take the time to view the link. It just came to my attention that I should put the time for certain characters down. Ashelin appears in the video, but after a couple of missions. For her introduction please view Jak 3 openning scene for the series to get a good example of her. Ashelin is a fiery, strong, independent character, with a dense exterior, a result of a cold background. She can come off as short-tempered and brief, and is a natural leader as a result of being the daughter of a ruler, and high-ranking officer in a military system. Despite this, she is significantly caring for those she is close to such as Torn and Jak. Also, despite her differing political beliefs and strong opposition, she appears to care for her father, often saying "this is for my father" while going into battle. Ashelin: Who the hell are you two? Ashelin: Keep talking and I'll raise your voice a couple of octaves. 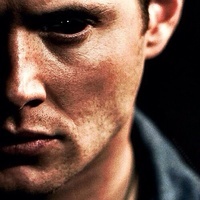 Ashelin: I'm not my father, you know. Ever since I was a little girl, I've looked down to the city streets from that ridiculous palace, and imagined a better place. Ashelin:(interrupting) Your father got us into this mess, so zip it before I come over there and play "daddy"! If you need an example of how Jak sounds then please take the time to view the link. In Jak II, he breaks away from his mutism, and after being subject to dark eco treatments for two years at the hands of Baron Praxis, his main basis becomes revenge, and he became angry and reckless—this is exacerbated by the presence of dark eco in his body. He also takes some enjoyment in killing metal heads and a fondness for guns.Nonetheless, Jak does retain some heroic personality traits. 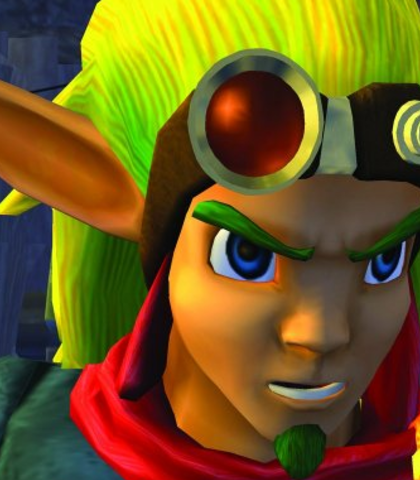 In Jak 3, where he gained light eco powers to balance the dark eco, he becomes less angry and more mature; which was further aided by the death of his father later on. 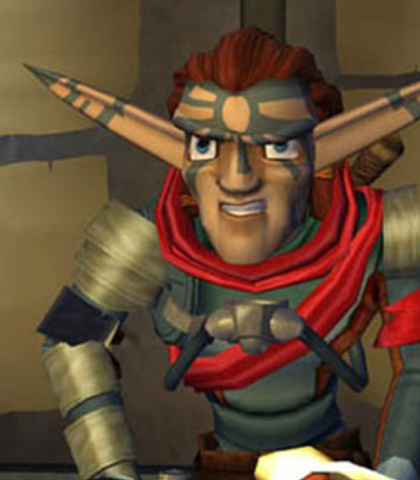 In Jak X: Combat Racing, he turned into somewhat of a relaxed character, though his final encounter with Mizo shows that the anger still exists under a calmer exterior. In The Lost Frontier, he seems to be more carefree and happy. Despite some scenes hinting his anger (for example, when he tries to turn to Dark Jak, seeing the Dark Warrior Program chair, among others) he seems to be more cheerful than the rest of the series. Jak: That's not OUR problem. Jak: We beat the Stadium Challenge. Jak: You don't like us, do you? Jak: Looks like you've won a few races. Isn't it true the city champion gets to tour the palace? Jak: You look like a reasonably smart man. I want information! Where the Hell am I?